Portuguese label printer Gráfica Calipolense has invested in a high-speed cutter, Polar N 115 AT HD, to boost its operations. Gráfica Calipolense is engaged in production of wet-glue, metalized and in-mould labels in both square and die cut shape. The firm replaced an aged Polar EMC machine with the Polar N 115 AT HD guillotine machine in order to increase production volume and boost cutting quality. Featuring special label options, the new Polar guillotine will complement the Gráfica’s three existing Polar machines. The label options for the new guillotine machine include Autotrim, a programmable function for the automatic removal of cutting waste as well as Downholder to prevent mixing and shingling of multiple ups when cutting. Other options include AirKnife to prevent cutting waste of statically charged material or plastic to increase efficiency. Polar said that the machine’s label options will ease the operation while increasing the quality of the labels. 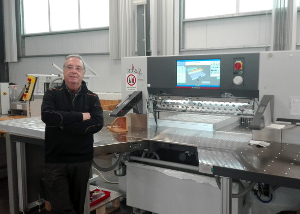 Gráfica Calipolense managing director José Carrasco said: “The purchase of another POLAR guillotine was based on the outstanding performance we experienced with this brand. In addition to Polar N 115 AT HD, Gráfica Calipolense purchased a Polar RA-4 jogger with weighing scale. The jogger has been installed in one of the existing CuttingSystems. Gráfica currently operates a Polar LabelSystem SC-21 with Autocut 115 and BM-105 for automatic cutting and banding of square cut labels. Image: Gráfica Calipolense managing director José Carrasco. Photo: courtesy of POLAR-Mohr.